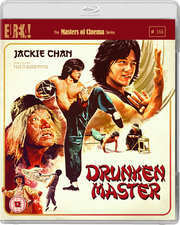 Unsurpassed... the definitive martial arts movie! Kung-Fu Classic starring the undisputed Godfather of Martial Arts Action-Comedy Jackie Chan in a no-holds-barred fight fest like none other! Jackie Chan plays Wong Fei-hung (a legendary Chinese folk hero who has also been portrayed on screen by Jet Li, Gordon Liu and Donnie Yen amongst many others), who is punished for his frequent troublemaking by being forced to study under the martial arts master Su Hua Chi (Yuen Siu-tien), notorious for his drinking as much as he is for leaving his students crippled. Wong proves himself an adept pupil, but his new skills are soon put to the test when his own father is targeted by a brutal assassin (Hwang Jang Lee, Snake in the Eagle s Shadow).